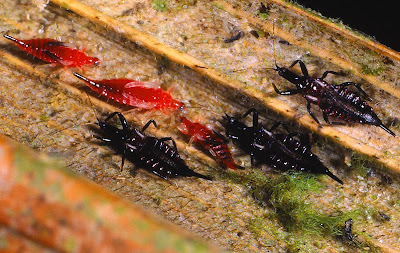 Adults and nymphs of Anactinothrips longisetis, from here. Anactinothrips is a genus of thrips found in the Neotropics. At least one species, A. gustaviae, exhibits social behaviour, with adults leaving immatures out to feed daily from an overnight bivouac (Mound & Marullo 1996). Characters (from Mound & Marullo 1996): Head with three pairs of long dorsal setae. Metanotum with one pair of very long setae. Metathoracic sternopleural sutures absent. Males with sharp angle on posterior margin of fore femora, making contact with series of ridges on fore coxae. Abdominal tergites each with one pair of wing-retaining setae.